Henry Wadsworth Longfellow’s 1842 poem, “The Rainy Day“, is appropriate for the weather the Twin Cities is experiencing in June. We received an entire season’s rainfall in under a week and are well over a foot above normal for precipitation this year. While it definitely is not cold, the wind has been surprisingly strong and relentless this month. Drought concerns were quickly replaced with flash flood warnings and river crest information. Mudslides, sand bagging efforts, road washouts, dam failures, levee breaches, disaster declarations, and a fool guiding a kayak over Minnehaha Falls recently dominated the news. Longfellow’s poem is especially ironic because the small Minnehaha Creek island base of the statue of Hiawatha and Minnehaha at Minnehaha Falls flooded. Some rain must fall, indeed. The songbirds in my backyard are wearing hip waders and swim goggles and the mosquitoes are out in force. Longfellow’s poem was not a weather observation. After all, it didn’t mention forecasts or reference a Doppler radar unit with a cutesy name. Despite its somber tone, the poem is an acknowledgement that life will get better after going through a dark period. In many ways, the dark periods are similar to summer thunderstorms. Some arrive with warning but fizzle out, others arise seemingly from nowhere and depart nearly as quickly, and still others linger for day upon dreary day before the sun peeks through a small hole and eventually burns away the darkness. Like a summer thunderstorm, sometimes the sun reveals damage requiring a cleanup effort. The effort is either small enough to undertake by oneself or large enough to require help from family and friends. It is important to keep the lines of communication open and keep offering to help. Sometimes knowing people are available to help is enough of a boost to begin repairs. I know I would not have made it through the past few years without a lot of support and love from my family and close friends, and from the support of people willing to help a stranger. Thank you for taking time from your day to read my musings, and thank you for your support! Oma lehmä on ojassa – cows and vested interests? The Twin Cities area is enduring a nearly record-breaking wet June. Areas in outstate Minnesota that were in moderate drought earlier this year are now lake front properties. The wet weather combined with an unusually huge mosquito hatching has curtailed outdoor activities, but allowed me to do some overdue de-cluttering. During my reorganizing, I found another intriguing Finnish translation Lucy kept. Linus Torvalds, the Finnish inventor of the Linux operating system, used the phrase “oma lehma ojassa” during an interview, which he said derives from “oma lehmä on ojassa“. The literal translation for the former phrase is “vested interests”; the latter phrase means “your cow is in the ditch”. The Finns have a great sense of humor and there are two explanations for the phrase. The first explanation is that pasture land is at a premium in Finland so having a cow in the ditch means getting a little free feed along with providing a public service by keeping the grass short enough to not obstruct visibility. The downside is a cow in the ditch likely becomes a cow on the road, and a cow on the road does not move swiftly away from an oncoming vehicle. Cows definitely share that trait with deer. The other explanation is that a cow sometimes broke through a fence and ended up in the ditch, oftentimes with water and deep mud in it. Once in the ditch, the cow could not climb back up to the pasture. The cow’s owner would require help getting the bovine out of the ditch and back to the pasture, so it was in the farmer’s best interest to persuade neighbors to help. Having a vested interest in a transaction or an outcome is not the same as a “quid pro quo” (from Latin meaning “this for that”) interest because one party does not expect something in return of the other party. For example, a corporation may sponsor a non-controversial charity event. The charity directly benefits from the sponsorship resources and the corporation indirectly benefits from positive public relations. A quid pro quo interest is a Political Action Committee (PAC) pouring money into a political candidate’s campaign. The campaign benefits from the cash infusions for ads but the candidate is now expected to something in return for the PAC. Many of the online Facebook games reward players if the player has a large number of “friends”. This basis for this type of vested interest relationship is mutual need and in some cases, the player gets scammed by a new-found “friend”. Relationships based on need disintegrate quickly after satisfying the need. Other online games promote a quid pro quo relationship with Facebook gaming “friends”. The player performs tasks or challenges for another player and hopes the other player reciprocates. A quid pro quo relationship usually dissolves because one party perceives the other party as not reciprocating in kind, of being all take and no give. Friendship in the purest sense of the word is not a vested interest or a quid pro quo arrangement. Its foundation is altruism and its floor is trust. True friends do favors without regard to payback, they trust each other unconditionally. No one carries a ledger book for tracking favor costs and no one is worrying about leaked secrets or damaging lies. It does not start out with a “you must trust me, but I don’t trust you” paradigm or with a combative disrespectful stance. Most of us have a great number of acquaintances and a small number of true friends. The true friends are worth cherishing. Let your close friends know that you appreciate them and that your life is better because of them. They don’t expect anything in return but would appreciate the sentiment. Give your special someone a meaningful hug or three. Hugs are free and always brighten someone’s day. As for vested interests, the proverbial “cow in the ditch”, save the livestock wrangling for an online farming game and minimize it in your life. Lucy and I would have celebrated our 26th wedding anniversary today. Please remember how she touched our lives and how special she was to all of us. June is a month filled with high school graduations, weddings, family get-togethers, and other celebrations. I have invitations to three high school graduation parties and a belated wedding celebration that conflicts with a graduation party. I am confident other invitations will arrive before the end of the month. Kudos to the graduates, and I wish you success and fulfillment in your lives. Congratulations to the newlyweds, and I hope you spend many happy years together. Kudos to the couples celebrating anniversaries this month, and I wish you many more years of your happily-ever-after. Lucy knew a number of Finnish words and phrases. She taught me that kiitos is Finnish for “thank you”. The first time I heard it, I thought she said “ketone” and I gave her a very puzzled look. I was curious why she wanted a solvent after I did something nice for her. After I asked her to repeat it, I caught the correct pronunciation and had a good laugh with her. As we began our house projects, we smiled when I would point at the “methyl ethyl thank you” cans in the hardware store paint section. It is probably not a funny joke to others, but every couple has at least one inside joke, catchphrase, or nickname that makes no sense to anyone else. It got her to laugh, and that was the important thing. Her laughter brightened so many of my days and nights, and I enjoyed getting her to laugh even at my expense. 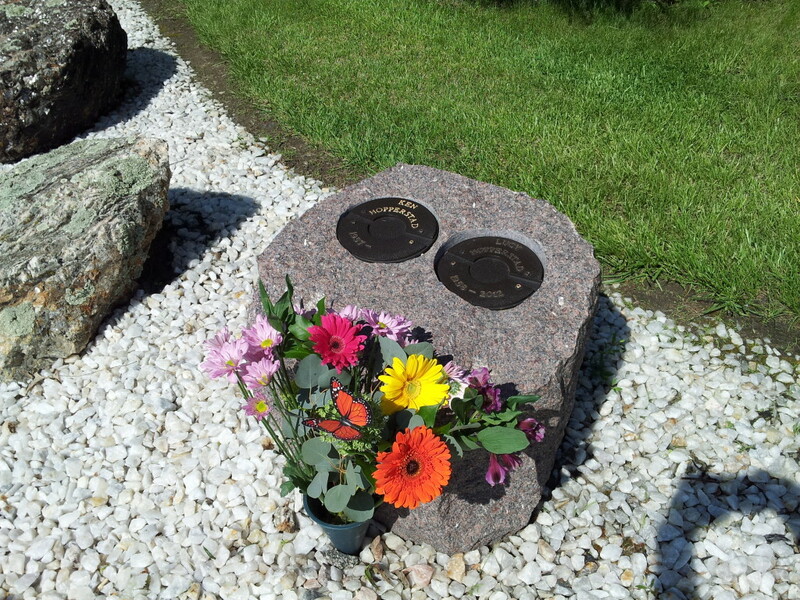 People have stories of seeing signs of a departed loved one, and that has happened to me on a surprising number of occasions since Lucy’s passing almost twenty-six months ago. This afternoon I was in the Griggs-Midway area of St. Paul dropping off medical equipment at the Goodwill/Easter Seals in the area; the donated medical equipment is then loaned to families in need. 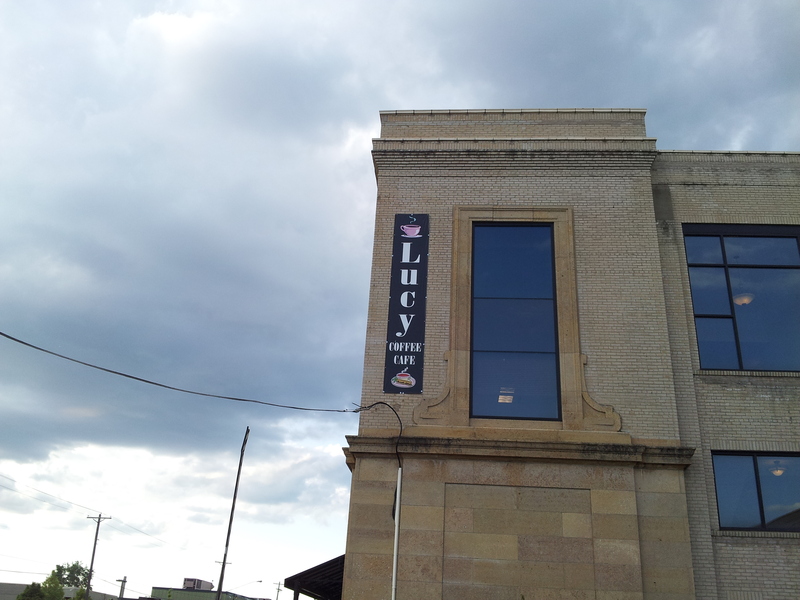 Today’s sign from Lucy was two stories tall on the side of a building: Lucy Coffee Cafe. I had no idea this place existed, and I saw it for the first time on our wedding anniversary. Thank you to everyone who called, posted on Facebook, tweeted, texted, and emailed me today. You are keeping Lucy’s memory alive and I am grateful for that. Thank you to my buddy who did a wonderful job of cheering me up again and has been such a great friend when I have needed one. Thank you to Lucy’s sisters for being such loving and supportive people. Give your special someone a meaningful hug when you can and tell that person kiitos from the bottom of your heart…and with clear pronunciation to prevent a trip to the hardware store. Happy anniversary, baby! I will always love you. My sign from Lucy on our anniversary. 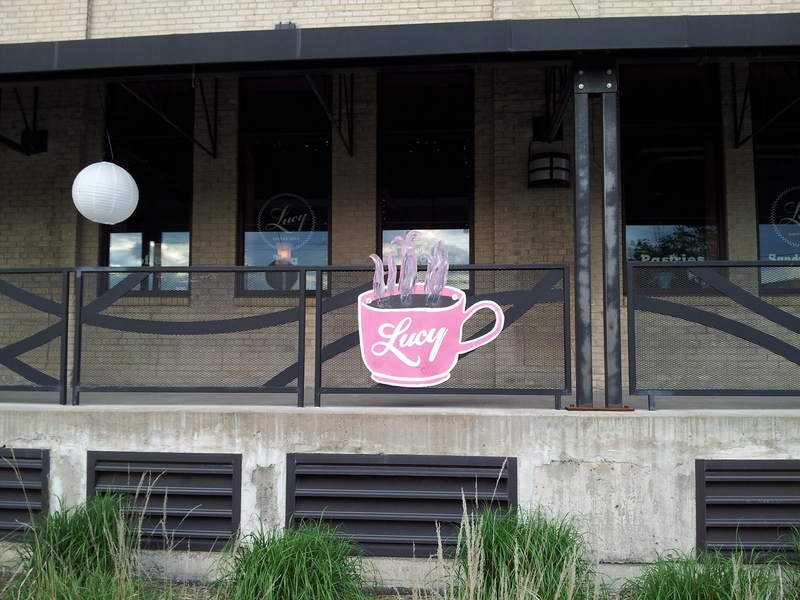 The outside of Lucy Coffee Cafe in St. Paul, MN.